The WHERE statement is an alternative to IF statement when it comes to subsetting a dataset. It is important to know the difference between these two statements. 1. The WHERE statement can be used in procedures to subset data while IF statement cannot be used in procedures. 2. WHERE can be used as a data set option while IF cannot be used as a data set option. 3. The WHERE statement is more efficient than IF statement. It tells SAS not to read all observations from the data set. Look at the LOG (shown below) after using WHERE statement, you only see a count of the number of observations that meet the criteria in the WHERE statement. Only 6 observations were read from the dataset READIN. In actual, the dataset READIN contains 14 observations. All 14 observations are read and the 6 that meet the IF criteria are placed in the new data set. NOTE : Both statements produced the same result. The where clause sends only those records that meet condition to PDV, the IF statement sends all the records to PDV and removes the records that do not meet condition before they get sent to the output buffer. 4. 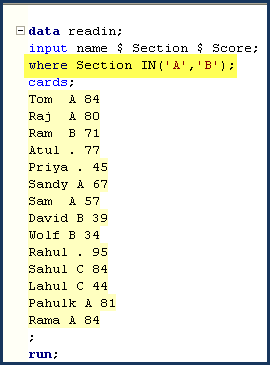 The WHERE statement can be used to search for all similar character values that sound alike while IF statement cannot be used. For example, you want to filter out all the names that sound alike 'Sam'. 1. When reading data using INPUT statement. IF Statement can be used when specifying an INPUT statement. WHERE statement can not be used when specifying an input statement. Suppose, you have data for college students’ mathematics scores. You want to rate them on the basis of their scores. 1. If a score is less than 40, create a new variable named “Rating” and give “Poor” rating to these students. 2. If a score is greater than or equal to 40 but less than 75, give “Average” rating to these students. 3. If a score is greater than or equal to 75 but less than or equal to 100, give “Excellent” rating to these students. This can be easily done using IF-THEN-ELSE IF statements. However, WHERE statement requires variables to exist in the data set. 3. When it is required to use newly created variables in data set. IF statement can be applied on a newly created variable whereas WHERE statement cannot be applied on a newly created variable. In the below example, IF statement doesn't require variables to exist in the READIN data set while WHERE statement requires variable to exist in the data set. WHERE statement cannot be applied on automatic variables such as _N_, First., Last. Variables. While IF statement can be applied on automatic variables. WHERE statement applies the subset condition before merging the data sets, Whereas, IF statement applies the subset condition after merging the data sets. It returns 2 observations. WHERE condition applied before merging. It applies separately on each of the 2 data sets before merging. It returns 0 observation as IF condition applied after merging. Since there is no observation in which value of score is less than or equal to 30, it returns zero observation. 31 Responses to "SAS : WHERE vs. 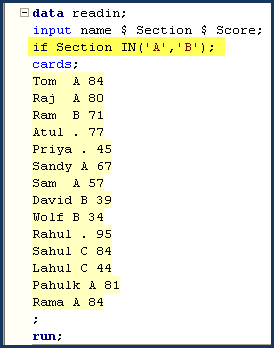 IF Statements"
While merging the datasets if the subsetting variable is not available in all the datasets listed in the merge statement we should use if subsetting statement instead of where..
Special where operators like is null, is missing, contains,like , between and cannot be used along with if statement. best site to learn sas.. great job!! 'd format is available for date9 or date7 formats and not for any other date format. Thanks a lot for such a useful documentation. Clarifies every bit of doubt. Very-2 Nice and helpful topics and interview question too. Request you could you please upload PDF for these topics and interview questions too so that can be read in offline as well. Please let us know your input on this suggestion. Thank you for a very clear difference. While merging by ID how are the scores merged? I mean, for a particular ID Which Score is going to come in the output window? I tried it, but got few from one set while few from another. Please clarify on this! !